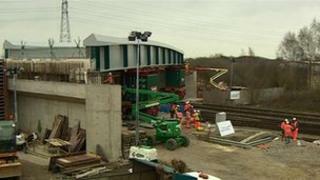 A 640 tonne bridge which will carry Nottingham's new tram line across a railway is being moved into place. Engineers are using four 40-wheel vehicles to lift the 46m (150ft) structure across Lenton Lane. From next year it will carry trams between Nottingham railway station and Chilwell, as part of a £570m extension to the network. Work began just after midnight, with the adjacent rail line closed until early on Monday morning. A special viewing area has been built so the public can watch the work. This is the second bridge to be installed as part of the project but the first to use this method. Martin Carroll, who is overseeing the project, said: "With this work, the structures team will meet another key milestone. "They will work in three shifts over the possession of the railway line, which has been meticulously planned to be carried out in 15 minute increments, to ensure we hand back the track before the rail possession ends."